This looks truly gorgeous – it has just the right amount of ‘swish’ – and I love the photos too, they are magazine worthy. Thank you Tialys. I love the way it moves when I walk! Two ickle buttons at the waistband – inspired. Love the skirt and you looked fabulous in it yesterday. Great photos! It is chic! You lookf fabulous in this skirt! Lovely skirt and gorgeous photography! The skirt is really great. The outfit is completely inspired and inspiring. Awesome photography too! Lovely skirt and great buttons. It was definitely worth the hassle of the hem. Love the photos too! Look at that gorgeous drape! A very flattering skirt… And I agree with Tialys, magazine worthy pics! I SO wish Mr CP was interested in even picking up a camera! Very chic!!! Love your style! Pretty lovely…black always seems so boring when its fabric but when its clothes its so elegant. Thank you Layla. I made a serious move away from black but I’m slowly coming back to it! Love your look! This skirt is beautiful, I can see it on other blogs but with medium weight fabrics, this one with lightweight fabric is gorgeous! Love the photos, as imaginative and love your jacket too. I bought some silk crepe that I hope to do exactly the same with!! This is a perfect wardrobe staple! You look amazing! It’s beautiful and you look so elegant in it! I love bias cut skirts but I have not tried a half circle skirt for myself before, I’m keeping this skirt idea for one day when I can get my hands on some awesome fabric like this. Thank you Erin. It was just polyester crepe. Mine was £4.50 a metre, the more expensive one. You can get it cheaper apparently. I think yours is one of the first sewing blogs I have ever come across – starting about a year ago. Now, with Mr.Ooobop’s photography, I think you’re the best. I mean, I have thought about beginning a blog. I sew a lot – mostly from Burda but, man, I could not come up with the lovely photos that enhance and complement what you write about. Well done, you’re an inspiration. Lovely skirt but also – wow – great shoes buttons gloves – and the photos themselves. Well done. oooh! that is so sophisticated and elegant. Love it!!! What can I say – I’m with all the others! I love those photos and I certainly fancy some of that swish in your skirt . SO. GOOD. Janene you’ve outdone yourself this time, the skirt, the outfit, the photos – inspired. Well done. Thank you so much. It will be a test to see if it’s any easier on the next one! You always do have the best photos! A fabulous outfit and beautifully made skirt! Looks chic.and practical. I need one of these. The styling is perfect. Thank you MSS. It’s certainly more practical than some of the tight pencil skirts I’ve been wearing! I heartily recommend the making and the wearing of one of these! ooh, gorgeous. So beautifully finished! I like to sew skirts like that, especially when i line them in a different colour under neath. You look fab. I am from Malta and loved your pictures and what your where wearing in my beautiful country. Soooo gorgeous!!!! Such a fabulous floaty fabric to swirl around in, and I especially love the waistband buttons – a great way to give a bit of detailed interest to an otherwise entirely practical garment 🙂 Those are my favourite details actually, because you get to enjoy them more often! You’re looking amazing here! Thanks lovely Clarey. And of course you can. He’d be delighted! 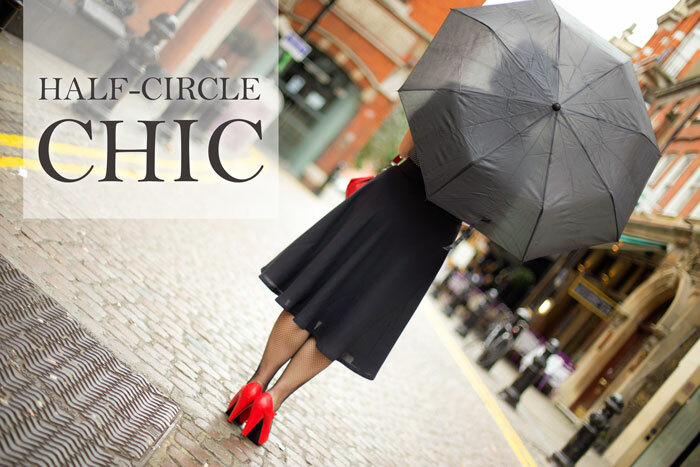 Perfect skirt, perfect styling, perfect photos. Struggling with light issues would be even harder sewing black…I feel for you! BUT how awesome to have such a wonderful stylish cool and adorable swingable swishly skirt like this. And I LOVE your styling and the photos are amazing. Such a pleasure to read with my toast! Lovely swishy skirt! I love those red shoes too. Gorgeous skirt and those shoes…just so Dorothy!! Pingback: Vintage 50s blouse with monogram | ooobop!